Are you making it easy for your website visitors to reach you? By placing your contact form in prominent places on your site, you’ll get more inquiries from your visitors. In this article, we’ll show you the top 6 places to include a contact form on your website for more leads. …it’s important to encourage visitors to take the first step in their customer journey. To help your website visitors get started, you’ll need a call to action on each page. This is some sort of prompt that will encourage a visitor to take action toward becoming a client, such as joining your email newsletter or downloading a an enticing content upgrade. But, how can you include a call to action on your blog’s posts and pages? And how will this help you get more leads? Well, there’s a simple solution: by creating a simple contact form. 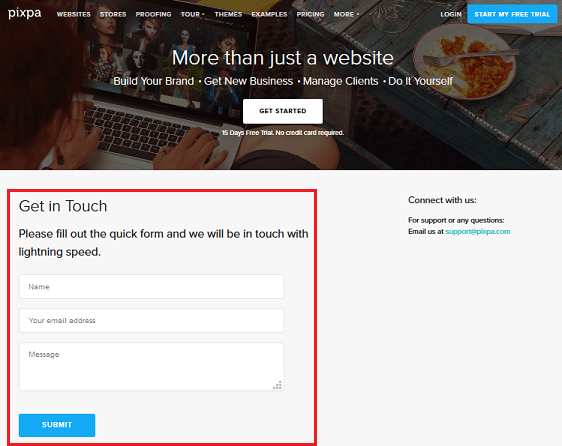 Here are 6 places to include a contact form on your website so you can start gathering more leads. Need help placing WordPress contact form widget? See our tutorial: how to add a contact form in a WordPress sidebar widget. What your business does using plain language. What happy customers are saying about their experiences with you. Who works at your company and how to reach each person. A story about how your products and services impact people. 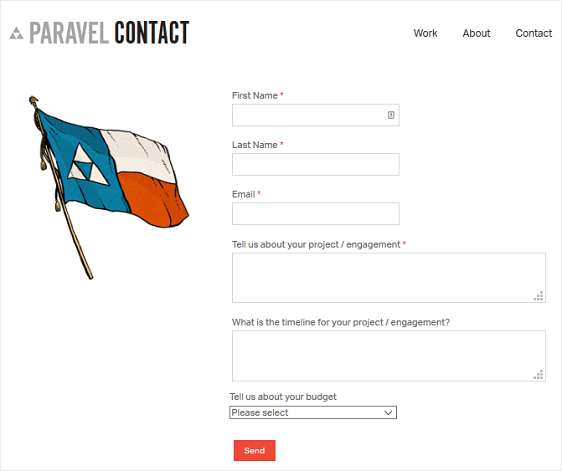 A call-to-action that motivates visitors to do something now, such as a contact form. 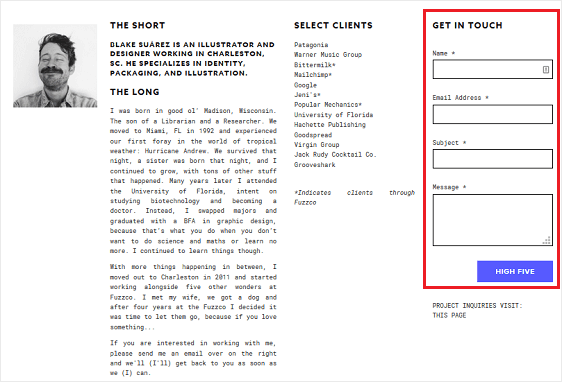 To see an example of an outstanding About Page, check out Blake Suarez’s website. The page builds trust, introduces the site owner, tells a story, and ends with a contact form. Your contact page is one of the most important pages on your website. People visiting it are more likely to do business with you. Spell out why someone should contact you and how you can help solve their needs. List your phone number for visitors that prefer to be supported by calling someone. Link to social media accounts like Twitter, Facebook, and Instagram to give visitors a way to engage with the business. Redirect visitors to a thank-you page that explains when and how you’ll be contacting them. If you make it easy for your visitors to reach you using the tips above, like Pixpa does in the example below, you’ll notice an increase in the number of leads you gather. There is a long-standing debate over whether you should place your contact form above or below the fold on your website’s homepage. And the truth is, each website will benefit from one or the other, depending on the target audience. According to a study conducted by Nielsen Norman Group, content placed above the fold was seen by site visitors 102% more times than anything placed below the fold. So, adding a contact form to your site like Paravel does will definitely get you action on your contact form since it’s well above the fold. That said, there is the notion that people who scroll do so for a reason. People scrolling down webpages are showing interest in what you have to offer, and because of this, are probably more likely to fill out and submit a contact form on your site, even if it appears below the fold. 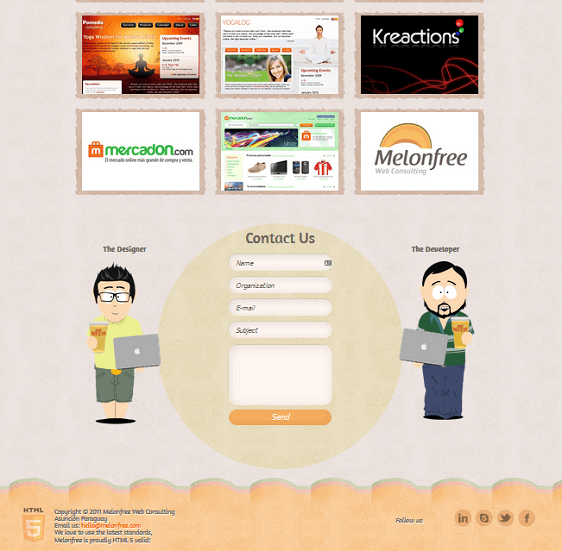 Take for instance Melonfree Web Consulting. Users must scroll all the way to the bottom of the page to access the contact form. However, along the way, users are viewing information about their services, learning why Melonfree is the company to go with, and even have access to a portfolio of past work. The idea with this is, if users get that far down a webpage, and realize they need to get in touch after learning all about your business, they will. Following the thinking mentioned above when it comes to placing contact forms below the fold on your site’s homepage, you might consider adding one below your site’s blog content. If you can hook readers with your site content, and want to give them a chance to contact you when they’ve seen what you have to offer, do so immediately following a blog post with a simple contact form. Lots of people scroll to the bottom of websites looking for more information. In fact, a lot of people look for social media icons, an About Us page, maps of physical store locations, and you guessed it, contact information. Rather than have site visitors navigate to a separate contact page, simplify the process for those that may be on the fence about your business in the first place. 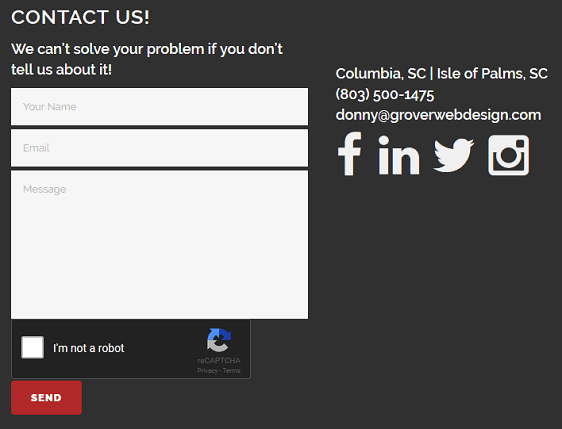 For inspiration, check out Grover Web Design’s footer section. Not only do they include a short contact form, they have their company’s physical address, phone number, and social media icons, which is exactly what people are looking for when they scroll to the footer of any website. If you need help doing this with WPForms, check out our step by step tutorial on how to add a contact form to your WordPress footer. And there you have it! 6 excellent places to put a contact form on your website so people can get in touch with you any time they need to. Want to do even more with your contact forms? Check out how to create a contact from popup in WordPress so you can add a contact form anywhere on your website.